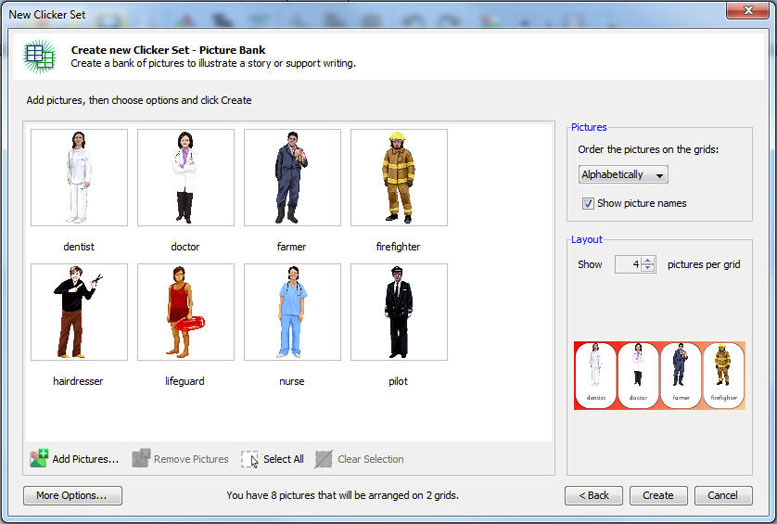 One of the Quick Grid Wizards available to use in Clicker 6 enables you to create picture banks in seconds. But did you know that with one click of the mouse you can instantly add the picture names to the cells as well, creating a word bank with pictures in a flash! Once your pictures have been entered into the wizard, simply tick the Show picture names box on the right hand side to add the text to the cells. If any of your pictures are named incorrectly you can alter the text by double clicking on it in the wizard, and entering the correct text in its place. Before the picture bank is created you can also choose the font that the text is displayed in, and alter the background colours, simply by clicking the More Options button at the bottom of the wizard. Danielle is an experienced teacher, having worked with students of all ages both in schools and as the eLearning teacher at one of UK’s City Learning Centres. Her expertise with using technology to support learning led her to work for Crick Software, where she is now the Curriculum Support Consultant, leading school INSET training with their software and creating print and video online support materials.